Here are those red shoes! On Wednesday, there is a luncheon at which the top winners all give short speeches, then Preview Night is from 5PM to 10PM. 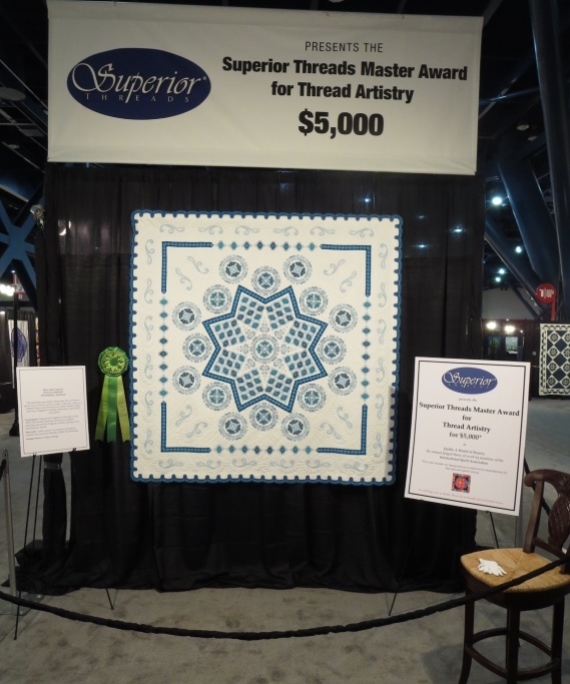 This is the way my quilt was displayed. 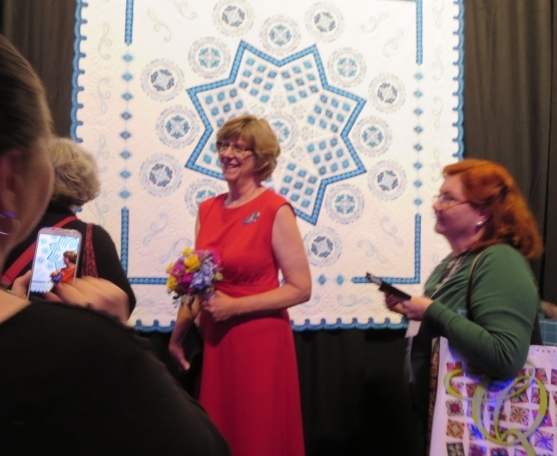 I spent a lot of time in front of my quilt for the next four days, talking to thousands of people. You can see all of the prize winners here. 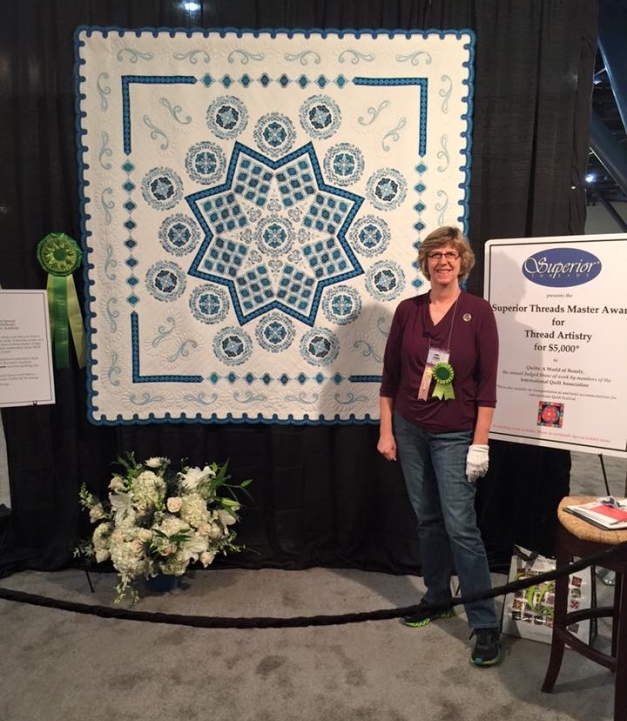 I was also awarded an Honorable Mention for my quilt Crystal Garden, but that’s a post for another day. 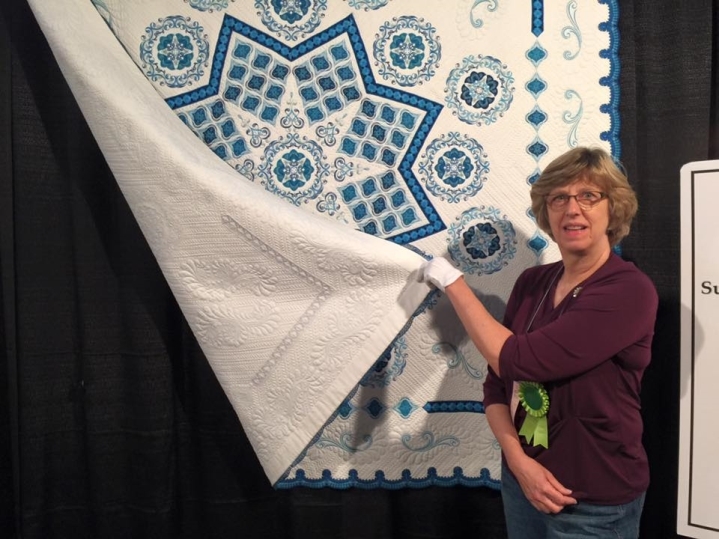 The quilt is 73″ x 73″, and was completed this year. 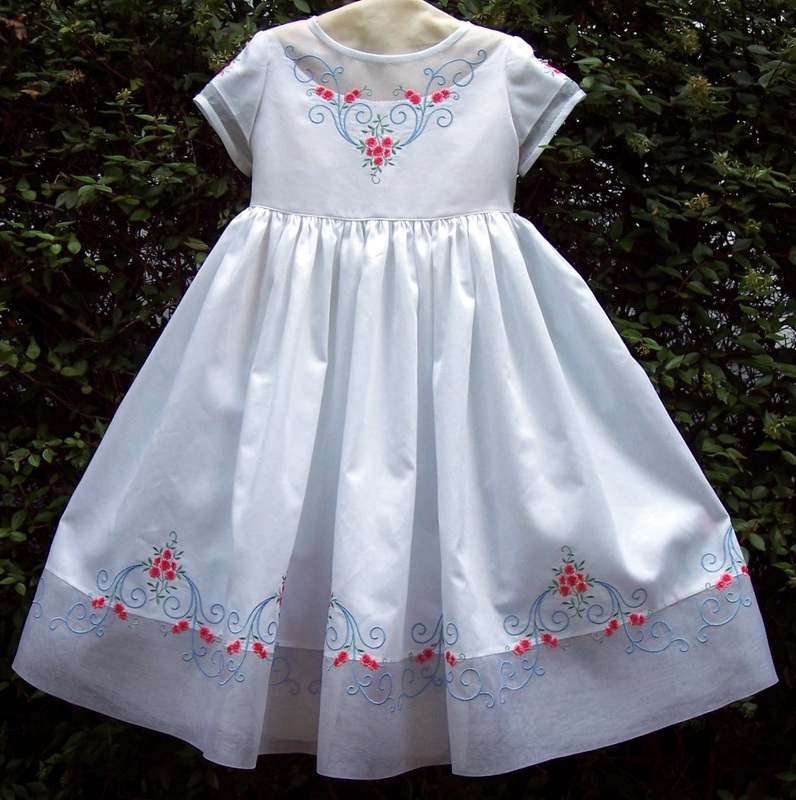 It is white cotton sateen on the front and back. 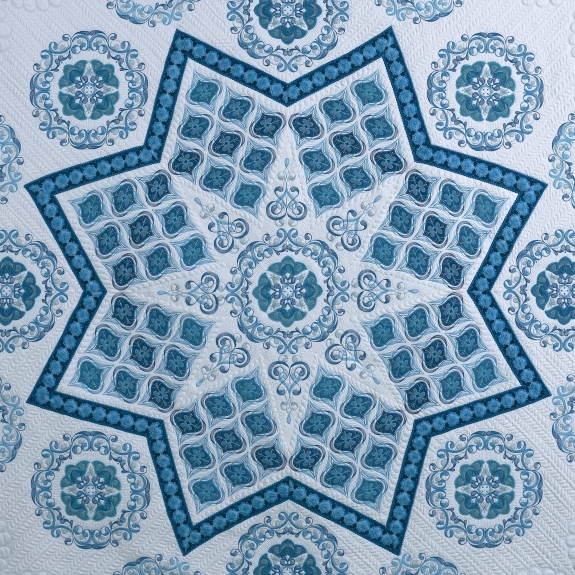 It all started with the dark blue print strip of fabric that surrounds the central star, and forms the border corners. That strip was left over from a quilt kit I cut out for my Mom to piece! The fabric was a print stripe, and this section wasn’t used, so I kept it. The colors for the quilt all flowed out of that little print strip. And the corners are the size they are because that’s all the fabric I had! 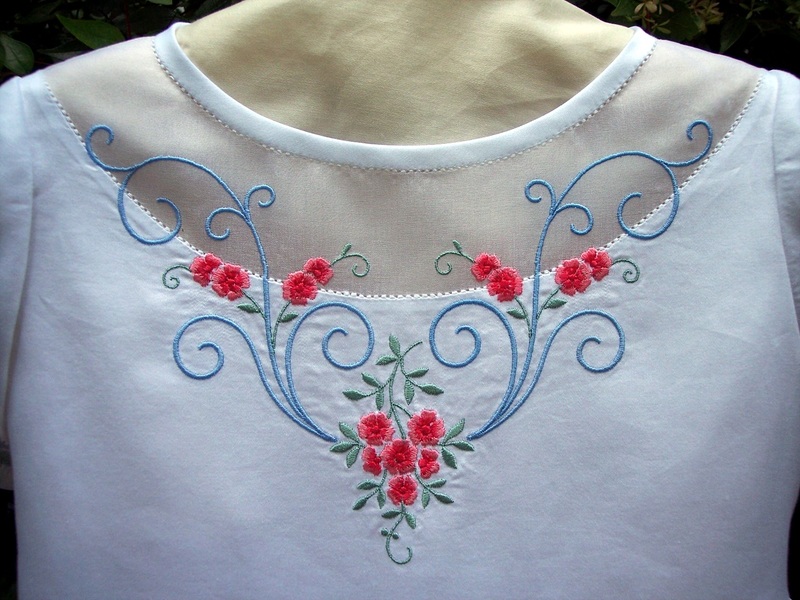 Those strips were appliqued on, then I used a decorative machine stitch – little satin stitch dots – to accent the edges. 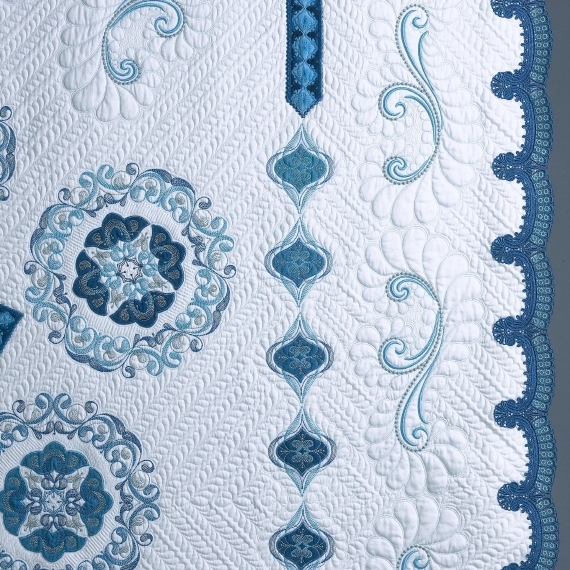 All the rest of the color on the quilt is digitized machine embroidery. The more solid-looking, darker areas are machine embroidery applique, done with old Cherrywood fabrics from my stash. 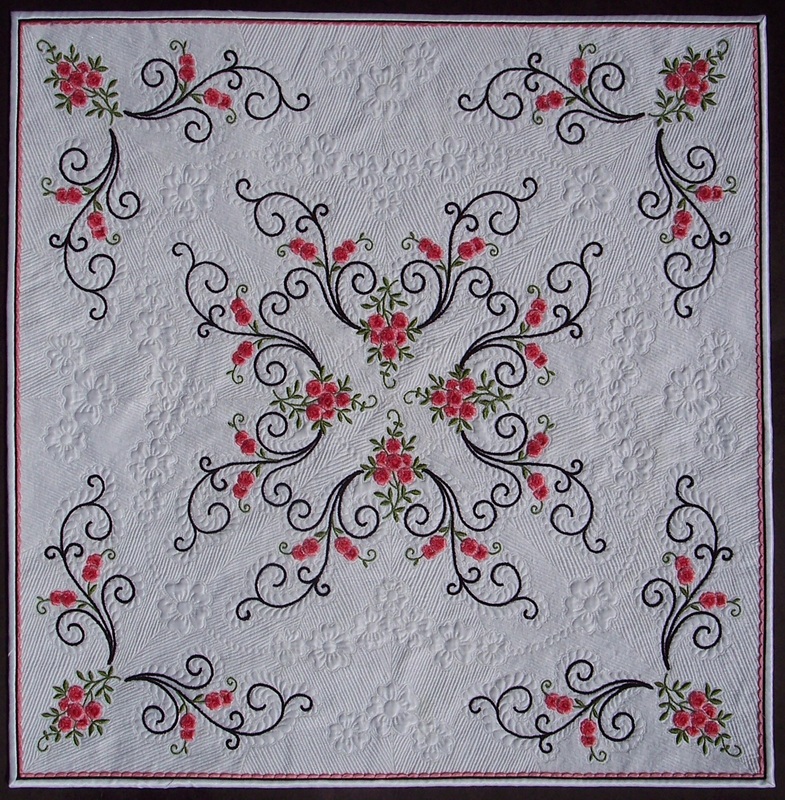 The free-standing lace border and the large swirl designs are from Zundt; the rest of the embroidery designs are from OESD. 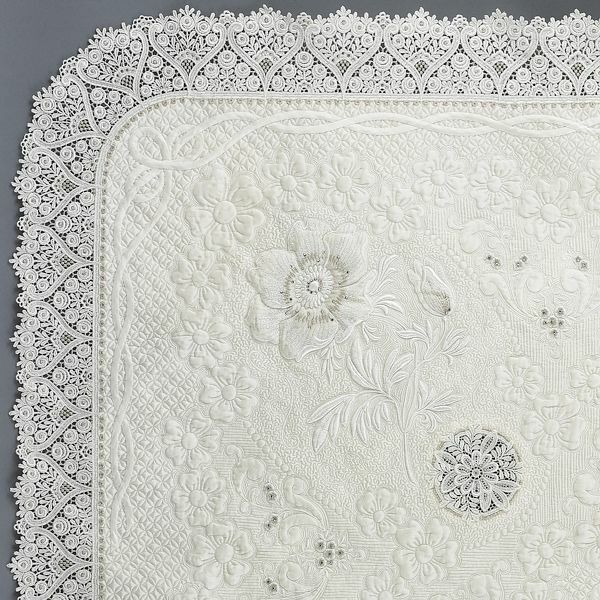 Except for the lace, the embroidery was all stitched on the quilt top only. 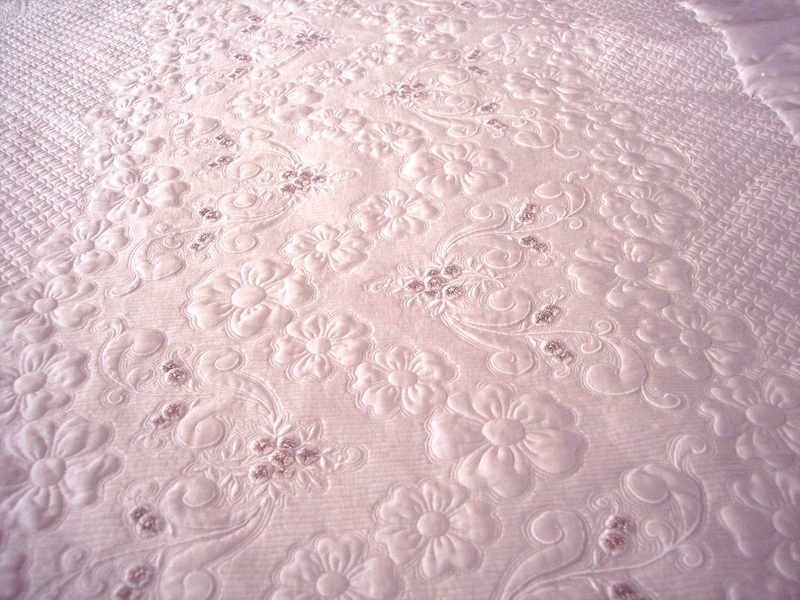 After the embroidery was completed, I layered the top, batting (Hobbs 80/20 bleached), and backing, then did all the quilting free-motion on my APQS George, which is a sit-down machine. 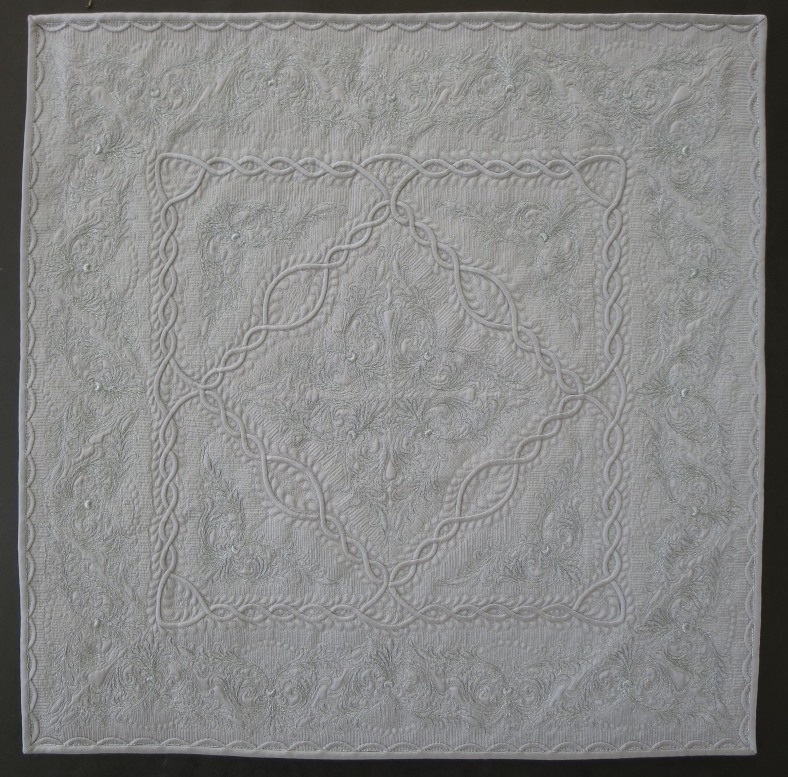 The quilting was done with The Bottom Line thread in the needle and bobbin. 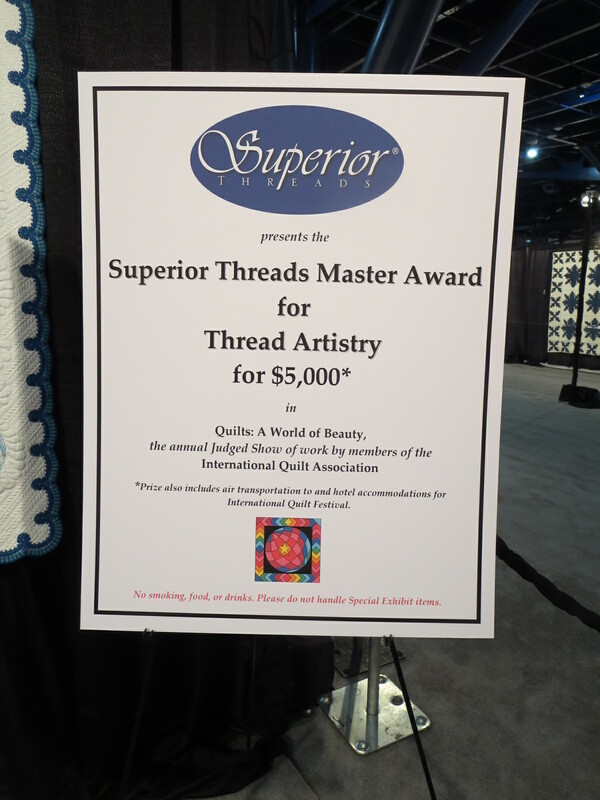 I usually like to use silk thread in the needle, but I didn’t think this quilt was going to be good enough to justify the expense! To make the lace, I embroidered segments on water-soluble stabilizer, joined all the segments together in a big loop, then soaked the stabilizer out. I soaked this for a couple of days, with several water changes, because I don’t want any stabilizer to remain in the lace. 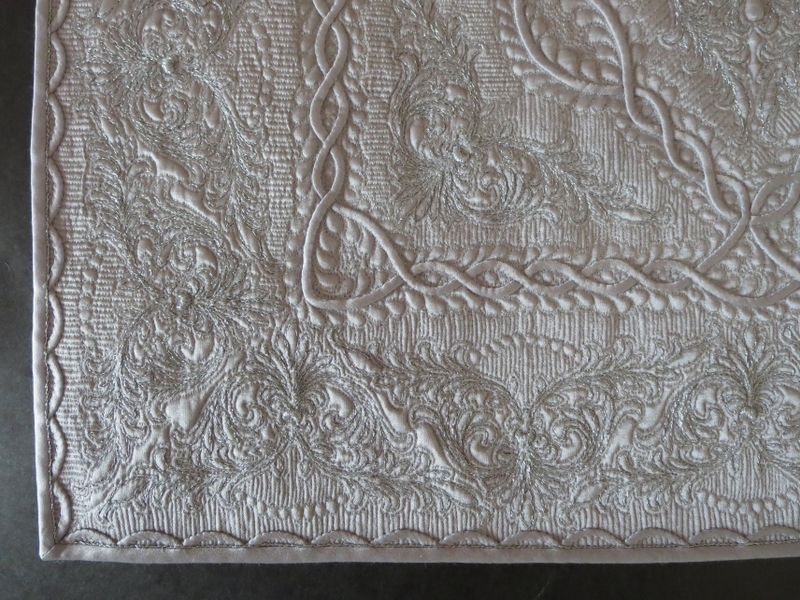 Then, after the lace was complete, and the quilting was all finished, I stitched the lace to the quilt, using free-motion stitching and monofilament thread. 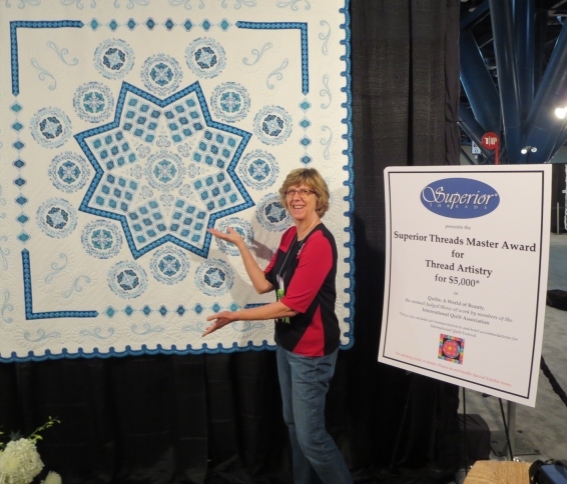 I hope this quilt does half as well at the other shows in which I’ve entered it! 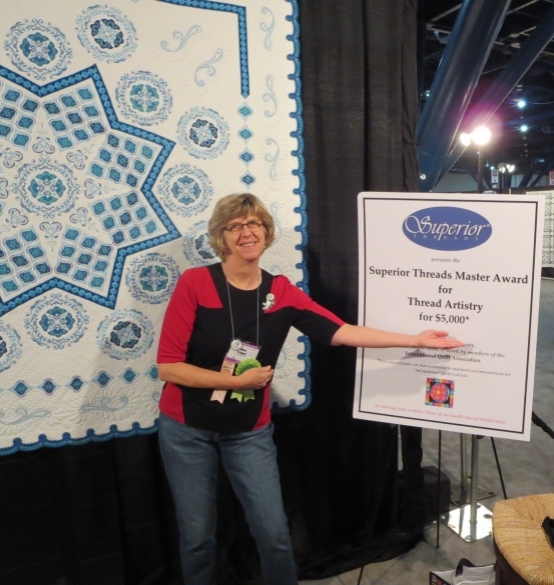 Now, it’s time to get back to work on my quilt to enter into next year’s Houston contest. 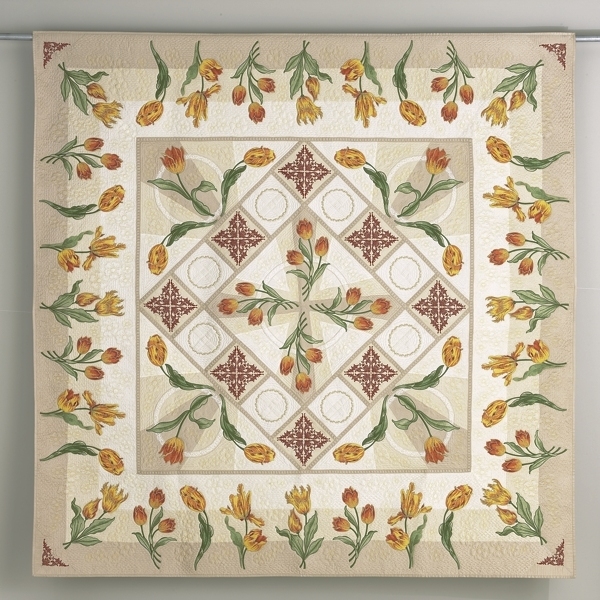 Corner designs are very common machine embroidery designs. This one is from Zundt, of course. It looks pretty simple, and rather uninspiring, right? 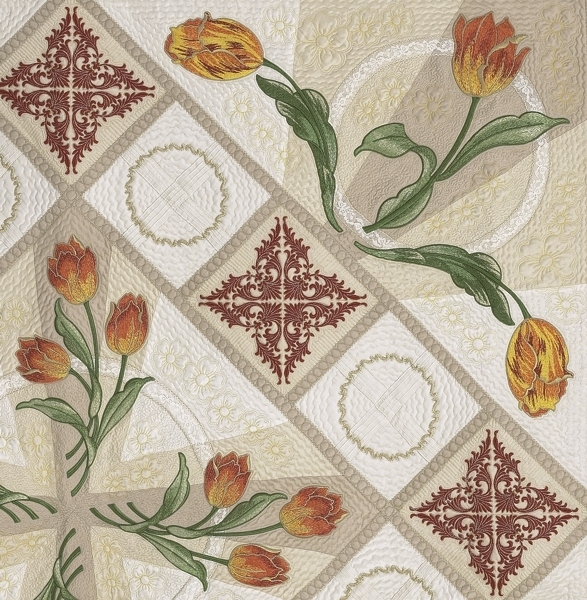 Here it is, stitched in the corners, for a little donation quilt I made for The National Quilt Museum. 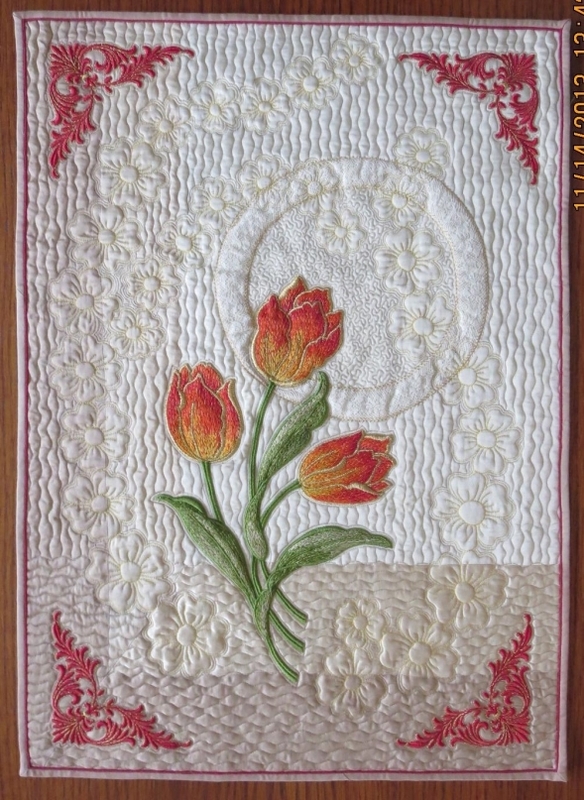 The fabric is silk/cotton Radiance, the large tulip is also a Zundt design, and the circle is shaped cotton lace insertion. Do you see the red embroidered on-point squares? 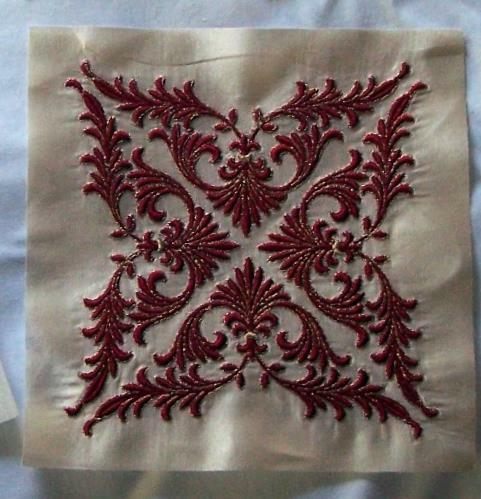 Those are made from this embroidery design, stitched four times in each block. I simply combined them on-screen on my machine, and stitched the entire block at one time. 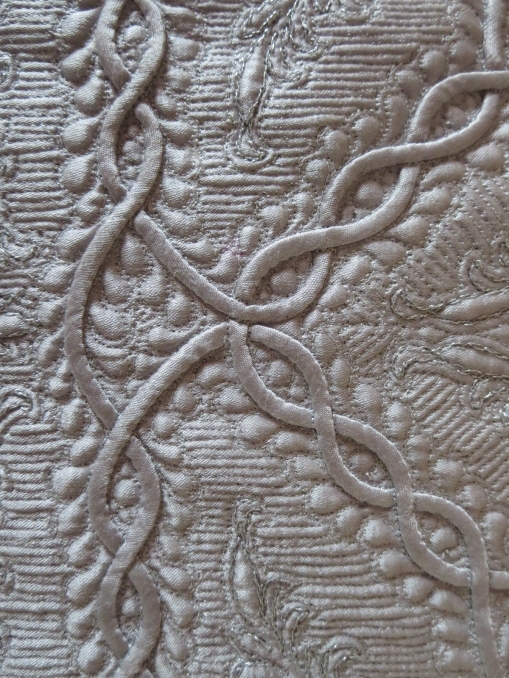 This has very dense satin stitch embroidery, outlined with gold metallic thread. I was thrilled (and very surprised!) 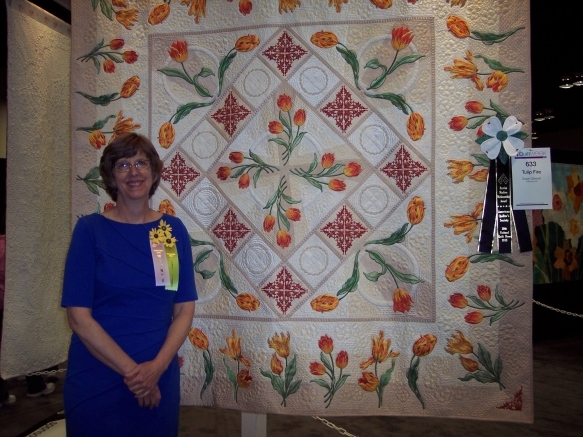 when this quilt won the Bernina award for Best Machine Workmanship at the 2013 AQS show in Paducah! Now, back to that embroidery design… If you skip the first color in the stitching (the satin stitching) and just stitch the second color (the metallic outline), you get an entirely different look from the same design, very light and airy. This is Argentum, a 17″ square miniature. So, I stitched this silver outline embroidery on silver Radiance, then hand-appliqued these teeny, tiny (about 1/8″ wide) bias tubes, then quilted the entire thing with Kimono silk 100 thread. 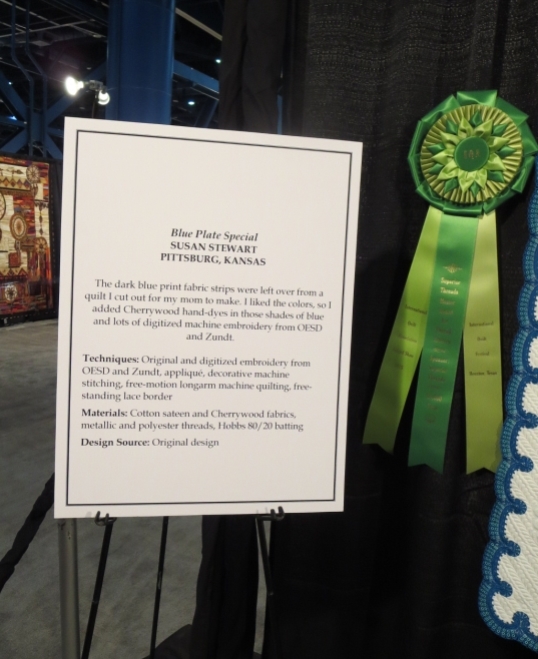 This little baby won first place in Miniatures at the 2014 Houston IQA show, and has been juried into 2015 Paducah. 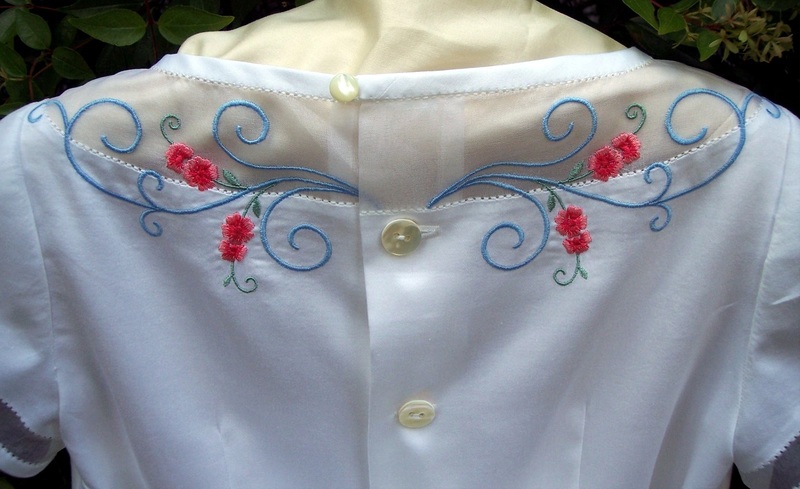 As you can see, these are very different looks from the same embroidery design! Think about different ways you can use your designs. Moving ahead almost 50 years (hey, I never said this blog would be chronological!) 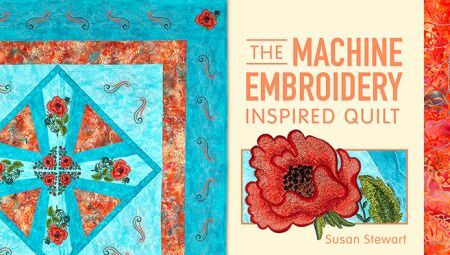 I wanted to show you a variety of ways to use a single machine embroidery design. This is a Zundt design, of course. 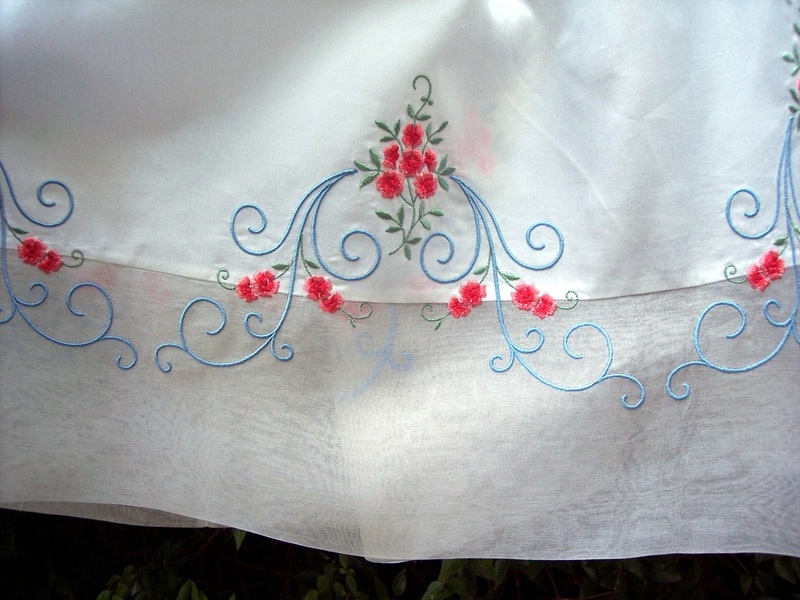 I first used it on a dress from my Rose pattern, which I taught at a couple of Martha Pullen schools in 2011. 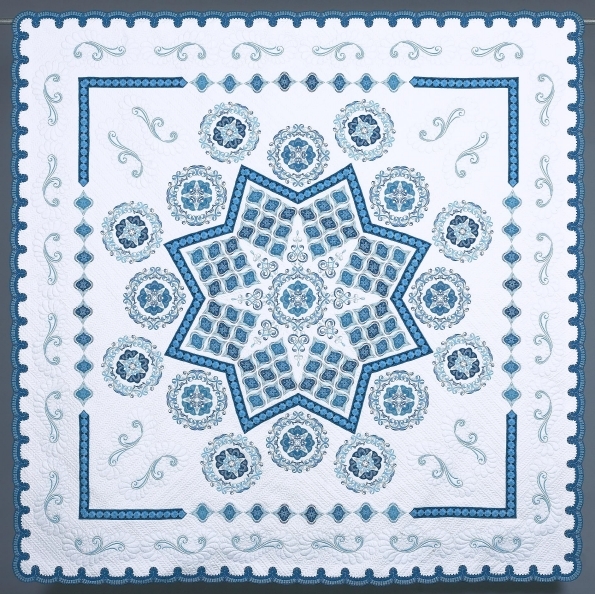 Then, switching to quilting, I used it (seventy-some times, I think) in Snow Flowers. 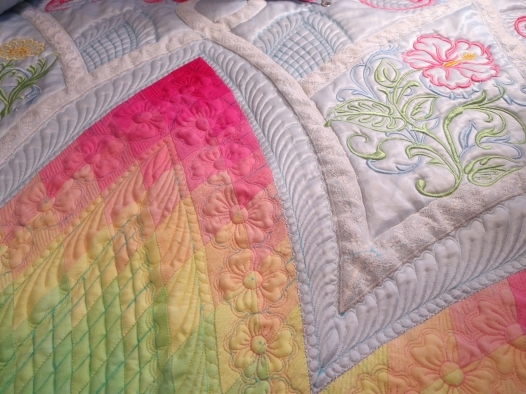 You can see the design here between the rows of quilted flowers. It’s not a very good photo, the quilt isn’t finished, it’s white, not pink, but this is the best photo I have of the use of this design. Here’s great photo, but you can only see a little of the scroll-y design. Finally, I made a 17″ x 17″ miniature using this design yet again! 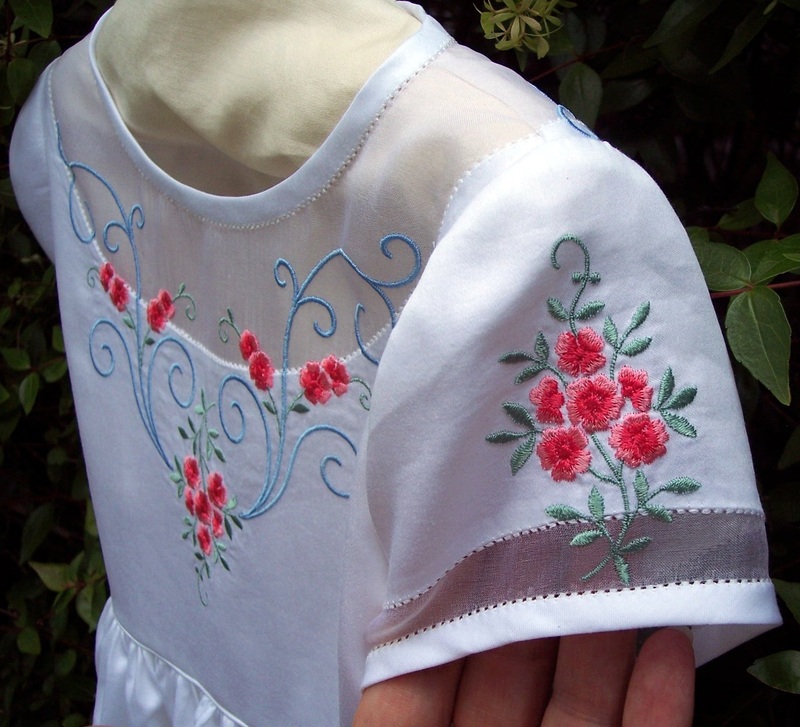 So the next time you look at embroidery designs, try to imagine all the ways they can be used!